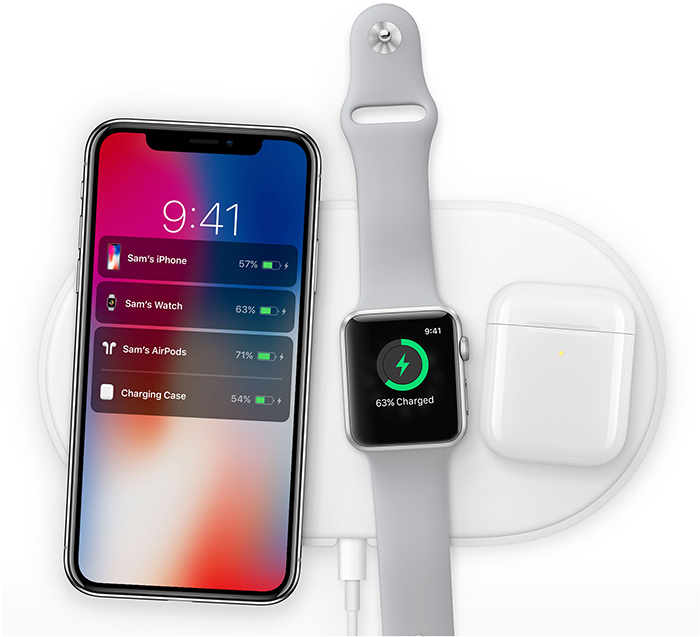 Glass passivated package (GPP) bridge rectifier orders for Apple's AirPower continue to pull in, according to sources at related suppliers, who expect shipments for the wireless charger to boost further when it becomes available later in 2019. Apple's AirPower is finally in production, said the sources. The Apple-designed wireless charging device was unveiled in September 2017, with the company originally targeting 2018 for launch. The supply chain-focused website published a similar article last year claiming the AirPower would be released by the end of March 2018, a release date echoed by at least two other sources at the time. That obviously did not happen, but perhaps the issues that led to the delay are now resolved. This isn't the first report we've seen that suggests the AirPower is still coming after all. Earlier this month, Hong Kong website ChargerLAB cited sources within Apple's supply chain who claimed that manufacturers Luxshare Precision and Pegatron have both started production of the AirPower by today. A few weeks prior, developer Steve Troughton-Smith said he's heard Apple may have overcome technical challenges with the AirPower and could move forward with a release. Those technical challenges included overheating and interference issues, according to Sonny Dickson, an occasional source of Apple leaks. And back in October, Apple analyst Ming-Chi Kuo claimed that Apple may launch the AirPower by early in the first quarter of 2019, according to a research note obtained by MacRumors. The first quarter spans January through March. AirPower is an oval-shaped mat that would be able to wirelessly charge multiple Apple devices at once, including the iPhone 8 and newer, Apple Watch Series 3 and newer, and AirPods when they are placed in an optional wireless charging case that is expected to launch alongside the AirPower. Apple first previewed the AirPower at Steve Jobs Theater in September 2017, shortly after introducing the iPhone X, and indicated that it would be released at some point in 2018 in a press release. Apple failed to deliver on that promise, however, and hasn't commented on the AirPower for many months. Apple also removed all but a few mentions of the AirPower from its website in September 2018. The mat is, however, still referenced in the latest iPhone user guides and in some recent Apple job listings. We also spotted a since-removed AirPower reference on the iPhone XS Smart Battery Case page in Malaysia. All in all, the chances of the AirPower launching soon are looking better and better. Update: The seemingly-never-ending AirPower saga continues. DigiTimes has quietly revised its article, removing any mention that the AirPower has entered production, but the report still mentions availability later in 2019. Hate to be a Negative Nancy, but is anyone really going to buy it at that point? I feel like everyone in the need has already saturated their wireless charger collection. its interesting everyone (ie newsites) are so focused on this charging mat. why is this even relevant anymore? its a bloody wireless charging mat! Yup, I still want it. Much like the Mac Pro, I anticipate the "Magical Charging Mat of the Future" to take 6 years to develop. How is this super convenient? It something that would occur maybe once or twice a week. Currently wireless charging isn't the chore some make it out to be... outside of the hyperbole filled narratives people like build to support their points. Wireless charging is old hat. It's newer to the Apple ecosystem, but it's still old hat. Put your phone on the charger. Boom. Same for watch. Boom. Place anywhere will be a neat technological achievement if it arrives. But that's it. It would be a neat tech achievement that could lead to a couple of less cables. Super convenient? Let's pump the brakes a bit on the hyperbolic enthusiasm. We're talking about the wireless charging of electronics. That's about as exciting as watching paint dry. It's possible that airpower turns out to one of those improvements which seems like a very minor benefit on paper, but ends up spoiling the user so much that they can't go back to cheaper alternatives. It's like how after I got the AirPods, I never used any of my previous headphones ever again. Sound quality was okay at best, but the AirPods more than made up for it in all the other areas, such as convenience and comfort. Was anyone even going to buy an iPod? Everyone in need had already saturated their MP3 player collection. It’s pretty clear that there’s nothing like AirPower on the market today and given Apple’s difficulties in getting it to work tells me that it’ll be a while before anybody else releases a wireless power charger that can charge multiple devices at once without any accurate placement. Just drop your devices randomly on the mat and charge them all. AirPower is the beginning of a roadmap. We’re at the very beginning of the beginning of wireless charging. Nobody is late to the game. Super convenient because it’s one cord, not 2 or 3 being plugged into different sockets. Buy one of these for the office and home, it’s super convenient for keeping devices charged. Being able to place anywhere and have all 3 devices charging at the same time will be great. Yeah, that's not super convenient. It may be marginally more convenient... and only in certain circumstances. It's not like you have to plug in the cords multiple times. You plug the pad/stand in once and forget it. If you have multiple, plug them into a surge strip. This isn't rocket science. One for the office and home? Everyone's different but outside of your phone, how many times do you actually think you'd charge your watch or AirPods at work? A $20 charging stand on your work desk makes infinitely (see I can do hyperbole too :D) more sense than a large mat taking up a lot of space. At home, there's no super convenience either. Your devices don't discharge at the same rate. As I said earlier, they would be on the mat at the same time once or twice a week, if that much... unless you charge needlessly just to get them on the pad together. The convenience factor goes down even further when you have to go to your bedroom every time to charge which ever device is low. If it makes it to market, cool. For those who'd want one, more power to them. But it ain't the 2nd coming that you're making it out to be.